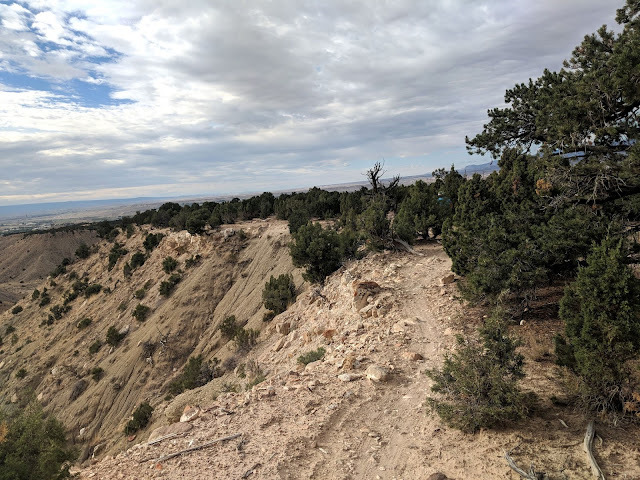 The trail was a mix of flowing sweeping sections, tight trails in the brush, turn-pedal-brake-climb-dips, wash crossings, and a sandy trail following the rim. 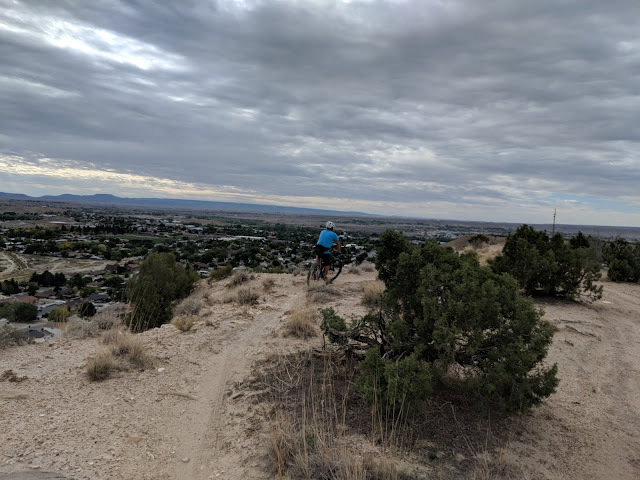 Truth be told, while I love the advantages of being clipped in, this ride added some technical aspects onto my "still getting used to being clipped in on more challenging trails" experience. I had one brief meeting with the dirt when I couldn't clip out fast enough as my tires hit a boulder the wrong way which was a great humbling experience. Like any tough girl (i.e. girl who likes to think she is tough) would do, I brushed off the dirt, did an inventory of the electronics (nothing broken), and pedaled away hoping my tumble was of the discrete variety. After this encounter, it was smooth(ish) sailing as we followed the rim of the mesa and dipped in and out of desert brush. I was glad I had a chance to experience some of Price's more technical trails and appreciate the chance to challenge myself on some different terrain. After all, girls with a few scrapes and bruises from the trail often have the best stories to tell. This local spot right above Price is "new" to the area. The Wood Hill Trail system officially opened up in May of 2017. 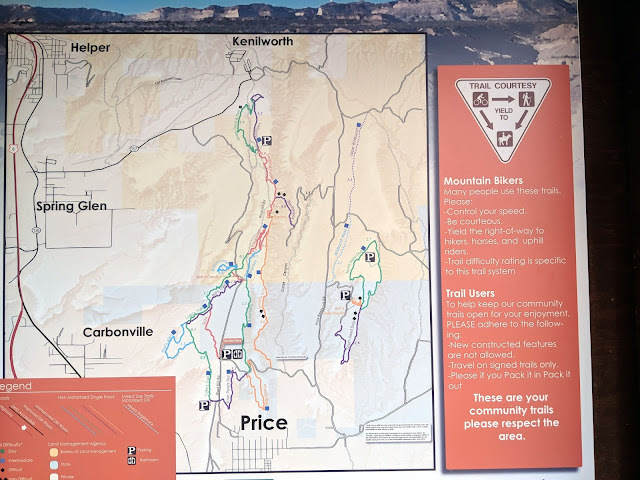 There is a parking area, bathroom, and kiosk with a trail map and information on the trails. The web of singletrack trails are well marked and easy to follow. The area is a multi-use trail system and the trails are open to horseback riders and dog walkers as well the two wheeled variety. On a Monday morning, we see one car at the trailhead and in true small town fashion, Mark knows exactly who it is. 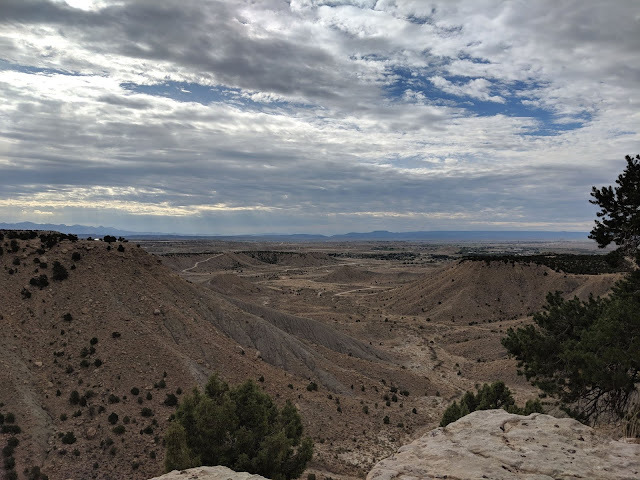 Once we parked the car and unloaded our bikes, we had the option of about 20 miles of trails perched on top of this mesa. I followed Mark's lead as we followed the trails, a truly unique experience biking on this table top overlooking the city not too far below. We started on Luke's Trail where I enjoyed some easy flowing singletrack through the junipers to start the day. It was the perfect warmup as I analyzed the sore spots from yesterdays ride and shifted my weight around. Let's be honest, I was not used to spending two days in a row in a small bicycle saddle and I was feeling day 2 more than I thought (oh those seat bones....). The Book Cliffs, which span from Utah to Colorado, make a beautiful backdrop as we ride along Luke's Trail and I take in the view of these desert mountains from the mesa we are biking on. 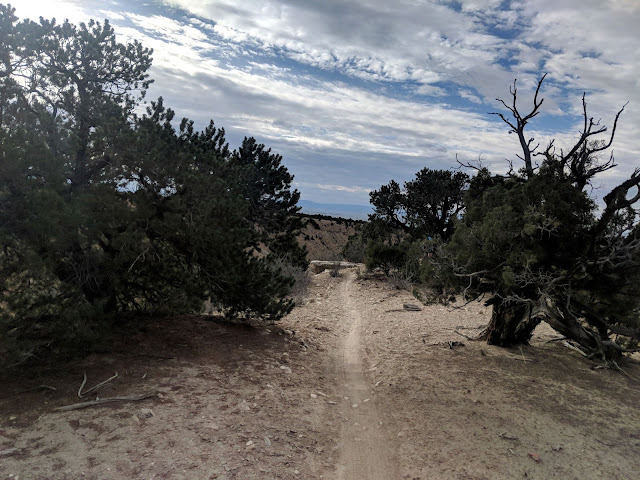 From there, Mark gives me the option of trails and we start to hop on some more technical sections like IMBAtween, weaving through pinyon pine and juniper trees on what I consider to be decently technical rocky singletrack. The trails are challenging me a bit but overall, I am enjoying the focus, the challenge, and the chance to see something a little different. The riding is slow and I do my best to follow Mark on the trails - in awe of the easy work he is making of these trails. Eventually we make our way back to some easier single track and follow the rim of the mesa where today's lesson from Mark is "Don't Turn Left". Below me I can see the quaint little City of Price and I immediately understand what a perfect little haven this trail system is for those who live here and those who stop to visit. Easy access to town, great views, varying single track from beginner to double blacks and not a soul to be found on the trails on an overcast Monday. It's a local treasure, a spot where the mountain bike team practices and where the locals like to walk their dogs. Proximity to Salt Lake City is also a winning factor, offering fantastic desert riding just under two hours south of Utah's capital Salt Lake City. 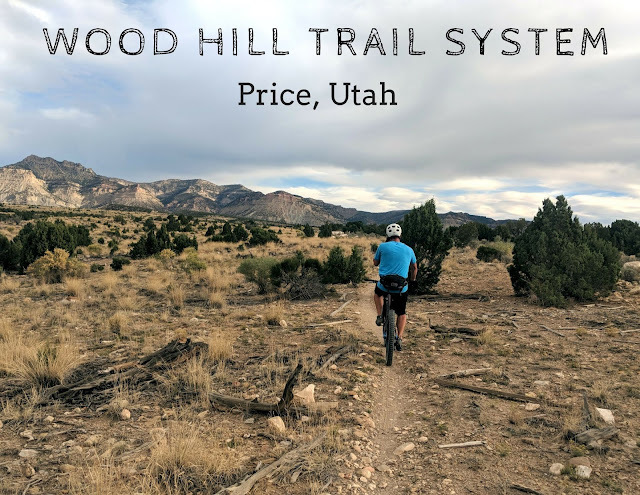 This is a great set of trails to ride on your way down south or the perfect final destination if you want scenic trails and technical riding without the masses. 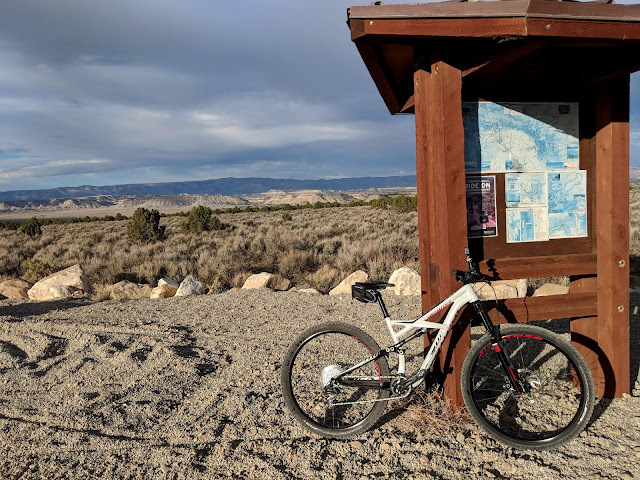 It's the combination of these factors that make this trail a perfect place to ride and a recreation haven for locals and out-of-towners alike. Directions: Head East on US 6 and take the first Price exit. Make a left turn into town (100 North). In one mile turn left on 300 East and then left onto 900 North. Follow the road (which will turn to a dirt road) as you climb the mesa. At the top of the mesa, stay straight and look for the trailhead.